I traveled around the Yaeyama islands following the typhoon 19. The beautiful beach was covered in a mountain of garbage such as bottles and polystyrene foam, fishing tools, beach sandals, and the various objects of everyday life that came flowing from Taiwan, China, Korea, and Southeast Asia. In the itinerary of my journey, I planned to walk routinely. Watching the flotsam in the coast, I immediately began to perceive the landscape differently. First, I noticed that there are some coasts with a lot of flotsam and others with little. The reasons were various: the effects of the monsoon and cleaning up the beach for tourism purposes, as well as geographical features. Also, I noticed that people frequently walked around and collected things from the seaside. Every morning, the beach was left with fresh footprints in the new line of flotsam. 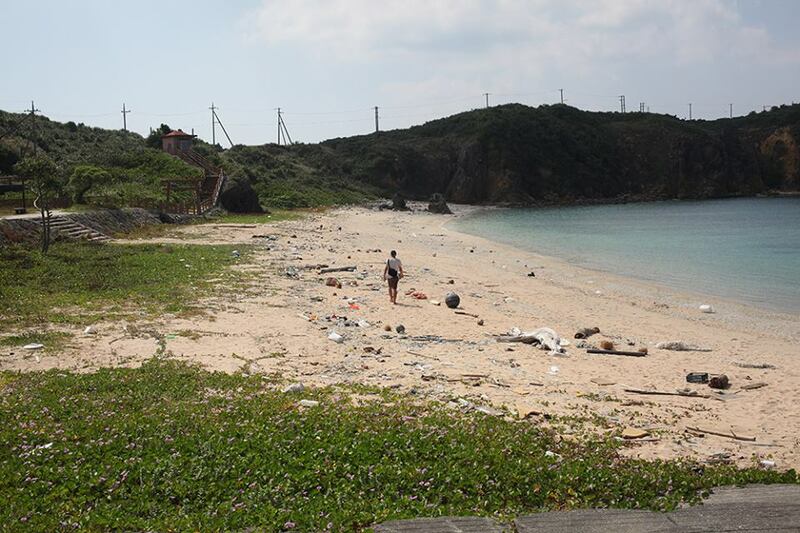 People I met at the seaside in Iriomote Island collected algae that washed up on the shore and dried it. They said that “it makes tomato delicious if you spread it in the field as fertilizer.” In addition to that, I met people who were picking up the seeds and toys, and people were making souvenirs by combining and attaching flotsam. I heard various stories and encountered people who live in the world that I have never known. A few months ago, I had the opportunity to meet and listen to Mr. Tadashi Ishii: a leading scholar in flotsam who has investigated around the Genkai coast in Fukuoka. He stated that “trees, washed ashore and collected, used to be used as firewood. The seaside shrine was also constructed from broken ships and drifting woods.” He continued, “If I find objects that are too large, I mark them by placing a stone or hiding them, but I find them gone when I go back again.” He told me this in a regretful way, I thought. The blessing from the sea means that it is not only seafood that can be taken in (via fishing) but also those things that come to the coast. 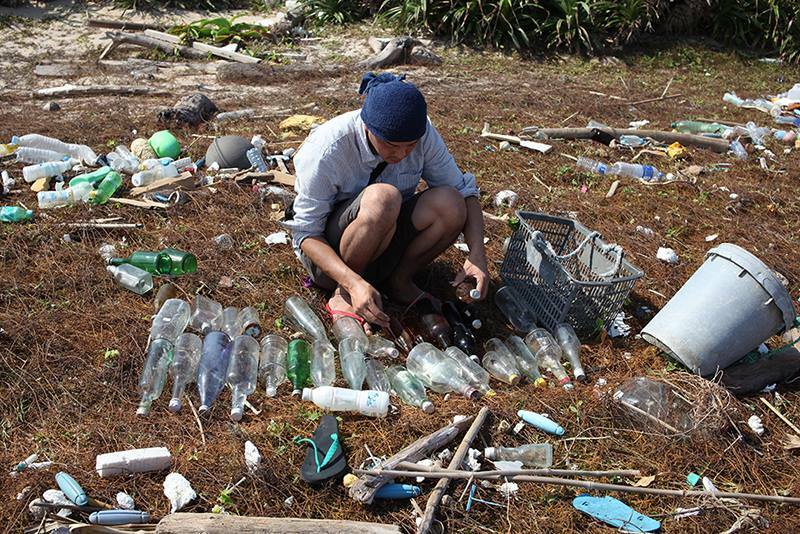 I felt that it was very regrettable that the polystyrene foam and PET bottles cannot be recycled easily. In Okinawa, the legend of Niraikanai states that God comes to bring blessings from the other side of the sea and then returns. The land of Okinawa also has a history that has accepted the “things posting,” and edited them not by weapons but by the vitality of the people in a peaceful way. In Okinawa there were a lot of Ryukyu glass workshops. The history of Ryukyu glass was begun by glass artisans who came from Nagasaki and Osaka in the Meiji era. After the war, they began to produce glassware souvenirs using glass discarded by the army who had occupied the area. Still in present day, many of the workshops are recycling glass from empty bottles of Awamori instead of Coke bottles. 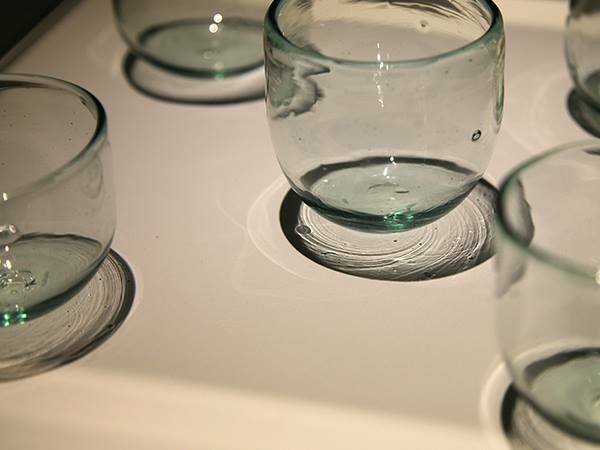 Glasses can seem to be solidified but consist of very fluid substances. Pottery solidifies by burning raw soil, but I felt that the glasses differed. The bottles washed ashore and worn, then burned in the kiln, were reborn, as if something like new life were emerging and bringing with it a vivid tension. When I looked upon the completed glass, there appeared to be a very beautiful shadow, projected through layers of components that were completely melted. More than anything, it was actually invisible. Various locations and various times were mixed inside this cup, and this brought me mysterious feelings. I brought home two of the glasses and toasted with them. A little crack began to appear in one of the cups when I was washing it. I felt a little sad but a little happy.